I didn't know I would have such a gift but right around Christmas I received an e-mail from my sister to say that she would be joining me in England. 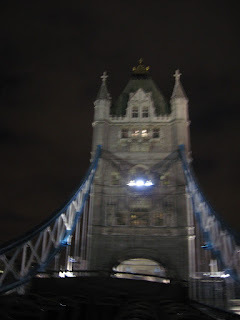 I had a week of vacation time which I had decided to spend visiting friends in London. To have my sister fly across from Canada to be with me was a wonderful Christmas present. Both of us are now big fans of air miles!! 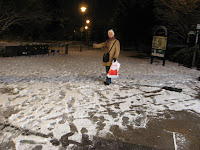 So here we are in jolly old England and wouldn't you know it, Bev brought Canadian winter weather with her! But how were we to know that the Brits would not welcome it with the delight and pleasure that a Canadian does a significant winter snowfall? 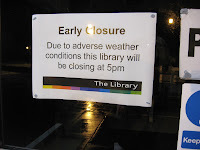 Let this be a warning to any Canadians thinking of bringing our delightful winter weather to any country unfamiliar with the beauties of snow, that they must also bring along snow tires, boots, winter clothing, salt (GRIT), and snow plows or people will be overwhelmed for days with the 'adverse weather conditions' that assail them! Nevertheless, we have got around quite a bit, which my feet can testify. My sister, though older and shorter of memory, is in far better physical condition than I and so at the end of each day I am dragging myself behind her trying to keep up and wanting only to be home with my feet up. If I have lost any of my generous build next time you see me, you will know it is Bev's fault! She never stops and especially not when we are passing any kind of shop that wafts the delightful aroma of a sweet delicious dessert. sigh. 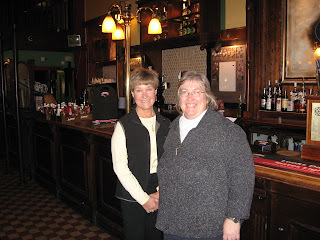 So on Tuesday afternoon we visited a friend of Bev's who works at St. Mark's church in Clapham Junction (http://www.stmarks-battersea.org.uk/). He showed us around this very alive Church of England church which is incredibly active and involved in the community and it was exciting to hear about what God is doing there and what God has done in Dave's life. 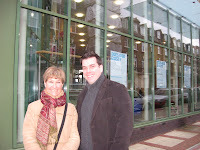 I really like the sign that you see in the windows behind Dave and Bev in this photo. 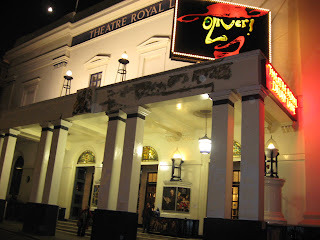 That evening we had a wonderful time attending the musical 'Oliver' at London's Royal Drury Lane Theatre. The next day we had a real treat, as it gave us the opportunity to meet cousins whom we never knew before. Their grandmother and our grandmother were sisters (making us second cousins) and they still live in the area Grandma grew up in. 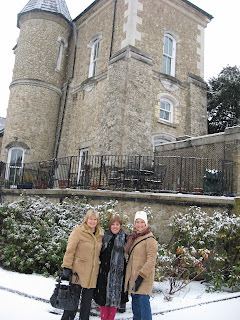 One of my cousins lives in a very interesting building that used to be the water pumping station but looks like a castle! The turret is part of her apartment - very cool. The four of us braved the winter weather and spent the day talking and talking and getting to know each other and learning more about each other's culture and backgrounds. How amazing it is to have family halfway around the globe and to share a common history with people you have never met before! Thursday we started to do more touristy stuff, like the city bus tour. 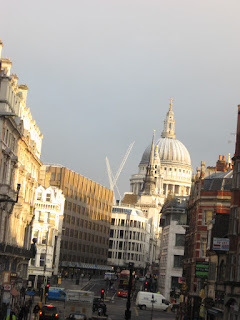 The highlight of that day was seeing St. Paul's Cathedral. What a beautiful and incredible place! Now I want to read up more on Christopher Wren, who was the very gifted architect of St. Paul's and other significant buildings in London. Posted by Barb at 2:36 a.m.